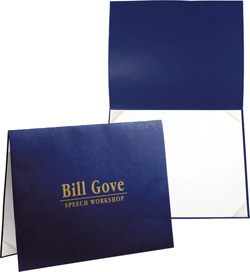 PackZen offers a full range of certificate holders designed to suit any occasion, festivity, or special event. We provide certificate holders that are not only affordable, but are also stylish and the perfect solution to present any type an award, credential or certificate. Whether you’re looking for an stylish, elegant way to display achievement documents or you want to present a fun or entertaining gift for a loved one, we offer a host of certificates and holders that differ in size and color as well as design. At PackZen, we want to be your go-to source when you need high-quality certificate holders or diploma covers. We use only the best products and materials and offer a vast array options and color schemes. Our goal is to make your award event as memorable as possible. Whether you need a diploma or certificate cover to be customized and imprinted with your company, university or school's logo or insignia, we’re proud to offer our customers a collection of customizable diploma folders, award holders, and certificate covers—all available in an assortment of vibrant, classic, and elegant colors and materials. PackZen custom decorations available in digital print, screen and litho printing. Foil stamp, embossing, debossing are also available.